One of my goals this year was to be more fiscally responsible and to get my finances in order. I've been keeping a secret(ish) Tumblr to help me along (and to teach myself to use Tumblr), but I don't think that's the best forum for personal finance blogs, and now that I know how to use it, I feel comfortable returning to the safety of Blogger. Hopefully some of you will find my financial updates helpful, but if you totally hate them, I promise not to post more than once a week (if that) about it, on Fiscal Fridays. More likely, it will just be a couple times a month. And, of course, while we dive into it, please remember that personal finance is just that - deeply personal, and deeply situational. I hope that some of my successes and stumblings will be helpful to you, but please don't compare yourself to me. We all have different situations (I have no student loans, but live in an extremely high cost-of-living city) and we're all doing the best we can. Go easy on yourself. And please, go easy on me! To catch us up, here are all my Progress Reports from the past few months. 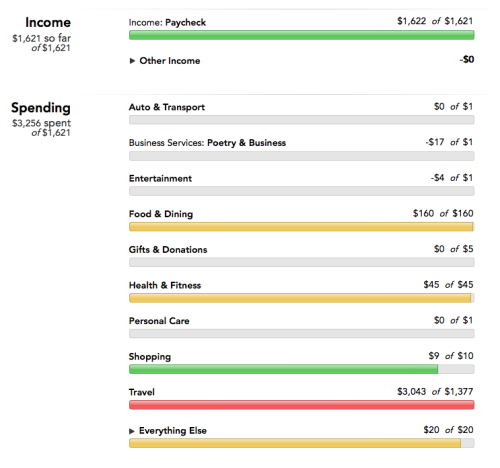 I track everything on Mint.com, and have recently been using a cash budget for my spending money. The income you see here is income for me, personally. It doesn't count any money that goes into retirement with my employer, or the $1000 I put into our joint savings each month (which pays for rent, utilities, and groceries). Of the money I take home each month, about half goes into savings: a Roth IRA ($458), a mutual fund account for my down payment savings ($200), and my SmartyPig accounts for an emergency fund ($75) and travel ($50). Also the past three months have been higher than usual because I haven't put any money into my employer sponsored retirement plan this summer, in order to save extra money for our upcoming trip to India. 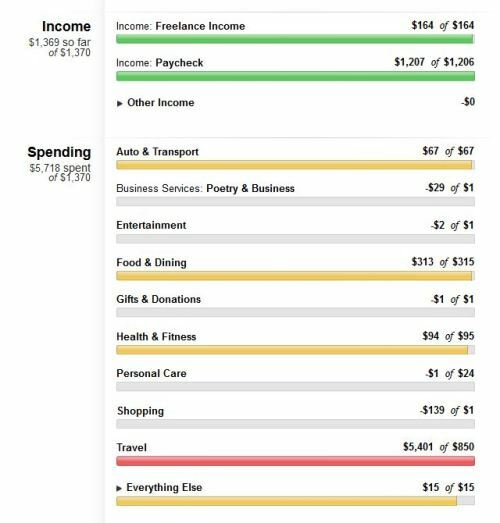 In general, $1,200 is my usual pay, and I try to spend about $300 in cash each month, though it has usually been closer to $400. July didn’t quite make up for the dip that I took in June, but it’s close. I’m not really sure how my returns from investments are looking. I know I should do a better job of tracking that, but I’m not even sure where to start. Any suggestions, friends? Remember how last month I had a $128 doctor’s bill and I was all like, “Probably that won’t happen next month so we’re clear!”? JK. I got a $500 bill this month, but it looks like that was mostly a result of a clerical error that I have (hopefully) had fixed, so no worries there. I hope. I used the cash budget in July again, to pretty good success. In June I used up the entire $300, so I took out another $300 this month, and I will be spending the last $20 of it on dinner and drinks tonight. I’m spending more of it on food than I’d really like, but I guess that’s where my priorities are right now. I spent about $85 on going to Trail Running Camp ($42 for bus tickets, and about $40 on two meals out and buying snacks and such for our cabin). I had such a blast, so it was definitely worth it. (Camp itself cost about $275, which I paid way back in January before I was really budgeting very much.) I also spent about $50 on going home for the 4th of July - $33 on a train ticket and $15 on a cute pair of fireworks shorts that I love. Also a blast, and a chance to see family and friends I rarely see any other time a year, so that was probably the best money I spent. I also had a massage for $65 at the start of the month, to try and work on my back (which is still sore today - oy). Other than that, the other $100 must have gone to eating out with friends (and, okay, with myself at lunch sometimes). I’d really like to get that number down, but it’s a process, like all things. J Crew Factory finally sent me a dress that I ordered back in March, so I originally put back the $70 that it cost me, since they charged my credit card for it this month, but when it arrived, it didn’t fit as I’d hoped, so I returned it and took the cash out again. Paying the $3.50 in shipping to return it reminded me of another reason to stop shopping online - returns are hard! I also decided to quit Weight Watchers. It’s an amazing program that really works, but I found I wasn’t putting my whole heart into it anymore, and saving $45 a month seemed worth it. For what it’s worth, I haven’t gained any weight since stopping a few weeks ago, so I’m hopeful I can maintain or even lose on my own. Since that was the last thing being charged to my credit card regularly, I may stop my monthly $100 automatic payment for now, since if I’m spending $0 on it, there’s no late fee if I don’t pay it on time. That will be a nice little bit to put into my India fund (and eventually into my emergency fund). Next month, I’m planning on a few fun things, which I’ll need to balance my budget around. I’m going to Rhode Island with my parents for a weekend, so I’ll need to pay for transportation to their house, and then transportation back to the city from Rhode Island. A friend is also coming in from Chicago for a weekend, so I know I’ll want to go out with her a bit, and I’ve already planned two dinners, a happy hour, and a book club. I’m also going to try and lower my budget to $240 (what I would have leftover if I start contributing an extra $100 to our joint account, which I should be doing), but I’ll give myself the lee-way to take out another $60 at the end of the month if I really need to. It’s a learning process, and hopefully making my lunch more often will keep me in the black! Also, August is the last month where I’ll be putting less into retirement than normal, so it will be the last of the extra $400 months for a little while. Looking forward to depositing that money straight into my India fund! It was sad to see my net worth take a hit this month, but the stock market took a dip yesterday. So it goes. This month looks like I had more freelance income than I actually did. $500 is from moving money from our joint account to my Smarty Pig, because I’d overpaid the joint account a few months ago when we were worried about making rent. The $62 is from credit card points. I used the cash budget in June again, to pretty good success. Since I had about $80 left over last month, this month I took out $220, for a total spending budget of $300. I did perfectly well with the budget, using up the last of it yesterday on a dinner out with a good friend, so I think $300 is my sweet spot for monthly spending right now. I’ll take it out again for July when I get paid tomorrow. One small failure is that I forgot about a $128 doctor’s bill, so I actually spent about $428 this month. But, hopefully no more of those will be popping up again soon! I also spent a fair amount of baby and bridal shower gifts this month. I love giving presents, so cutting back in that area has been even harder than cutting back on eating out! Next month, I’m planning on a few fun things, which I’ll need to balance my budget around. I’m going to my parents’ house for 4th of July ($33) and possibly running a race there ($25); I’m going to Trail Running Camp, which is already paid for, but I’ll need to get transportation up there (maybe $50); and our 11th anniversary is coming up and we’re hosting a little potluck for it (probably out of the joint account), even if we’re probably skipping gifts for each other. Wish me luck! May had a small amount of freelance income (from acting as a reader in a poetry contest and from selling some things on eBay), but otherwise, the $1200 or so is the normal amount I’ll be taking home each month. 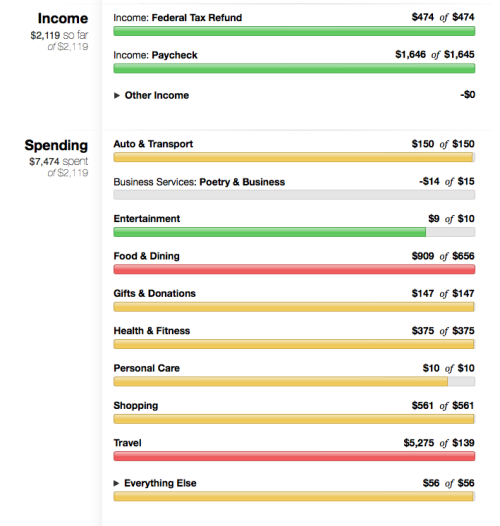 This month, I decided to try out a cash budget, after spending way too much last month. I took out $400 at the start of the month, and promised myself I wouldn’t take out any more if I ran out at the end of the month. (I should normally take out $300 if I want to stay on budget, but I knew that I had to book my reservations for my partner’s reunion, which I thought would cost $170, so I wanted to be a little conservative.) In part because the reunion was a little cheaper than I expected ($130) and in part because I skipped a barbecue that was outside of the city, I ended up saving a good amount of money, and had $85 leftover at the end. Using only cash made me much more conscious of my spending. I still went out to eat more often than I would ultimately like, but I definitely cut back a bit. The rest of the money was spent on train tickets (home for Mother’s Day and to run in the Freihofer’s Race in Albany this weekend). I didn’t buy any material objects, which felt great. Next month, I’ll take home some extra money, because I’ve decided to stop contributing to my 403b for two months. I usually put in 15%, but there’s no employer match yet, and since my bank account could really use a little extra cash right now, I feel good about that. I’ve contributed to my retirement since I started working at 22 and I’m still contributing 10% to my Roth IRA, so I’m not too worried about retired me suffering. I’m also planning to take out less cash tomorrow, about $220, so that I’m rolling over the amount I saved from this month for a total of $300. On that budget, I’ll attend the reunion, a birthday party, a baby shower, and a potluck wedding. Wish me luck! This is just to give you an idea of where I'm starting from. I overspent in April, thanks in part to excitement over a new job, lunches out, and overspending on clothing. I don't usually spend this much, but I do go way over budget every month, and it's not good. Since this is my first post with monthly spending, I should also mention that the “debts” you see here (Travel and Food & Dining) are actually paid off, but my savings account is very slim because of it. (All this spending is also not just from this month. It carries over from month to month as I pay it off or build the savings for certain things. I promise I did not spend $5k on travel in a month where I never left the city.) 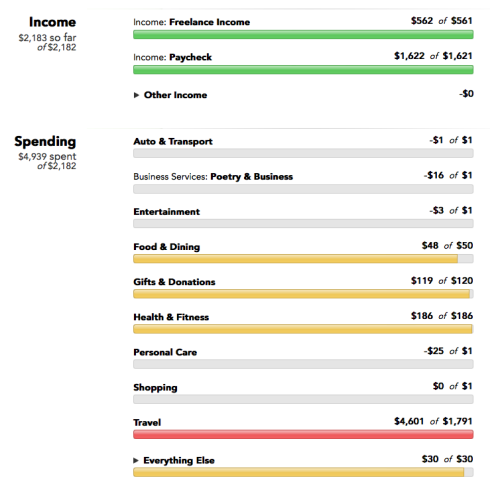 I’m working toward "paying off” those two categories by putting more money into savings. I’m lucky enough not to have any credit card debt, which is especially good because my lowest APR is around 16%, but I’d like to keep it that way, and considering the red lines as debt helps me save up more quickly. In May, my personal take home pay will be $1,200, and I am planning to take out $500 for a cash budget, and save the rest. Wish me luck!